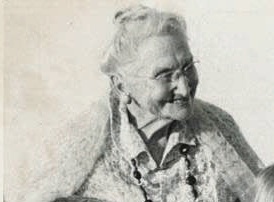 In 1915 Miss Agnes Alexander pioneered to Japan. In 1921 she was the first to introduce the Faith to Korea. In 1957, Shoghi Effendi elevated Miss Alexander to the rank of Hand of the Cause of God. In 1964, the Universal House of Justice appointed Miss Alexander as their representative to the election of the first National Spiritual Assembly of the Bahá’ís of the Hawaiian Islands. Miss Agnes Alexander passed away in 1971 and is buried behind Kawaiahao Church in Honolulu. 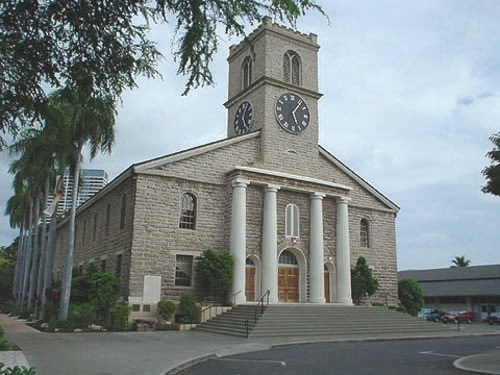 Miss Agnes Alexander is buried behind Kawaiahao Church which is at the corner of South King Street and Punchbowl Avenue near the State Capitol and across the street from City Hall (Honolulu Hale). • Take Nimitz Highway 92 from the airport. Make a left at Bethel and a right on South King Street. • Stay in the right lane when crossing Punchbowl and turn right off South King Street onto Kawaiahao Street. Park on the short narrow street behind the church. • Miss Alexander is buried in the Alexander family plot behind Kawaiahao Church. Go behind the church and through the wrought iron gate. Walk straight ahead to the end of the aisle. Look to your left. You will see Ms. Alexander’s stone between that of her sister and brother.